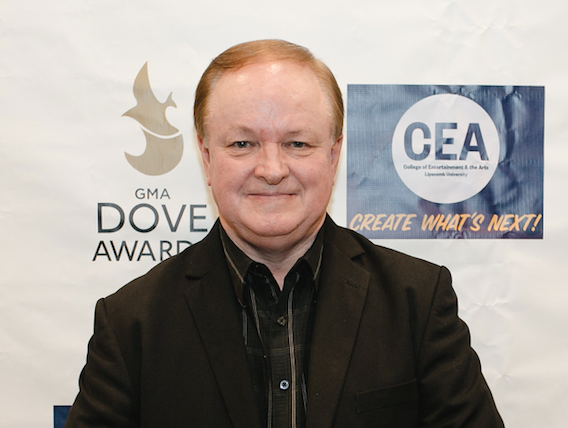 Steve Mauldin, an adjunct music technology instructor in the School of Music, was recently honored by the Gospel Music Association with the Dove Award, their highest honor, for his work on For the Sake the Love. The religious musical was recognized in the “Best Musical/Choral Collection of the Year” category and was created by Lee Black, Camp Kirkland, Cliff Durren, Phil Nitz and Mauldin. Mauldin received his classical degree, a Bachelor of Music in Music Theory, from Furman University in 1976. He became a staff musician with Mark Five Recording Studios in 1972, played bass guitar on stage for Chet Atkins and has recorded with nationally-recognized artists including Carrie Underwood, Chely Wright, B.J. Thomas, Amy Grant, Ricky Skaggs, Seals & Crofts, Ray Price, Kenny Rogers, Pat Boone, The Gaither Vocal Band, Michael McDonald, Gary Puckett, Brooklyn Tabernacle Choir, Collective Soul, Avalon and Willie Nelson. For ten years he produced and arranged for legendary pianist Floyd Cramer and served as musical director for Buddy Emmons and the Swing Shift Band. An acclaimed producer and arranger, Mauldin’s accolades include the 2007 Singing News: Best Southern Gospel Album award, six nominations for the Gospel Music Dove Award and Arranger of the Year (1998, 1999 and 2002) by the Southern Gospel Music Association. He has conducted his arrangements with numerous orchestras including the Nashville Symphony and the North Carolina Symphony. His original compositions also appear in jingles, television (CMT’s 100 Greatest Love Songs) and several films. In 2005, Mauldin returned to Belmont to resume teaching Computer Assisted Music Notation, a course he pioneered in the early nineties. While teaching, he entered the master’s program and received a Master of Music Composition degree in 2009.